MEET OUR NEIGHBOR CUBA AGAIN, FOR THE FIRST TIME. THE ART OF DEALING WITH CUBA. CUBA REFUSES TO RETURN SEIZED ART DESPITE THAW IN RELATIONS WITH US. WHO IS NEW ÉPOCA? Initially when I began researching about the economic state of Cuba and how can a design solution help a country, the United States and Cuba has not yet established an interest in renewing a relationship between the two countries. I began researching the economic stated of Cuba and found an insight that was quite interesting; in most situations where a country suffers from harsh economic conditions, such a lack of technology, information, product and no source of income the creative community and economy should have wither away, yet Cuba’ creative economy and community thrives. So my thesis transformed in an unexpected way. My new thesis direction had more to do with assisting the changing Cuban economy as it transitions into a free market while getting Americans to learn from this unique country and its culture. OUR SOLUTION I knew there was a design solution for this need. This is why New Época's design solution is based off the three freedoms I found that Cubans lack; freedom of income with a collaborative product line, freedom of speech with a magazine, and finally freedom of information with a website. The overall goal with New Época is to share and expose the Cuban culture, art, and mind-set to Americans and Cubans- Americans while creating a resource of income and speech for Cubans. One of the main reason why Cuba’s creative community is flourishing against all odds is called technological disobedience (a big word which really just means the breaking the rules in which a product’s technical use was intended for). Cuba lacked the resources that they need, so now Cubans make due with what they have, and have been in a type of survival mode. Men and women used broken parts of found objects to create something new. This along with the stress caused by the embargo and strict government, created a new perception for the Cuban people; or a new era of innovation. The Cuban people with no jobs, no money, and no business, had to get creative, and had to think outside the box. This is called the resolver mind-set; improving by repurposing the scarce resources around you, which became a way of Cuban life. This resolver mind-set spilled over to their art culture, and over time has become one of Cuba’s strongest assets. Many Cuban artists make earn more than most engineers, teachers, and doctors, and often find work and pay from outside the government salaries. By supporting Cuban arts and culture as the regulations of the embargo slowly change Americans are supporting the Cuban people as a whole and give them hope ( in better income, and voice ) moving forward to the new era of change between the two countries that are ninety miles away from each other. A BRIEF RUN DOWN ON WHAT’S BEEN GOING ON DOWN THERE. Ten Years War of independence ends in a truce with Spain promising reforms and greater autonomy - promises that were mostly never met. Jose Marti leads a second war of independence; US declares war on Spain. US defeats Spain, which gives up all claims to Cuba and cedes it to the US. Cuba becomes independent with Tomas Estrada Palma as president; Platt Amendment keeps the island under US protection and gives the US the right to intervene. Estrada resigns and the United States occupies Cuba following a rebellion led by Jose Miguel Gomez. Jose Miguel Gomez becomes president following elections supervised by the US, but is soon tarred by corruption. Gerado Machado institutes vigorous measures, on mining, agriculture and public works, but established a brutal dictatorship. Socialist Party founded, forming the basis of the Communist Party. Machado overthrown in a coup led by Sergeant Fulgencio Batista. The US abandons its right to intervene in Cuba’s internal affairs, revises Cuba’s sugar quota and changes tariffs to favour Cuba. Batista retires and is succeeded by the civilian Ramon Gray San Martin. Castro lands in eastern Cuba from Mexico and takes to the Sierra Maestra mountains where, aided by Ernesto “Che” Guevara, he wages a guerrilla war. The US withdraws military aid to Batista. Castro leads army, forcing Batista to flee. Castro becomes prime minister, Raul, becomes his deputy and Guevara third in command. The US sponsors an abortive invasion by Cuban exiles at the Bay of Pigs; Castro proclaims Cuba a communist state and begins to ally it with the USSR. Cuban missile crisis ignites when Castro allows the USSR to deploy nuclear missiles on the island. The crisis was resolved when the USSR agreed to remove the missiles in return for the withdrawal of US nuclear missiles from Turkey. Soviet military advisers leave Cuba following the collapse of the USSR. Cuban Communist Party approves a new socialist constitution; Castro elected president. Around 125,000 Cubans, many of them released convicts, flee to the US. 1996 tion of many state farms into semi-autonomous cooperatives, and the legalization of limited individual private enterprise. US trade embargo made permanent in response to Cuba’s shooting down of two US aircraft operated by Miam– based Cuban exiles. POPE JOHN PAUL II VISITS CUBA. The US eases restrictions on the sending of money to relatives by Cuban Americans. NOV - Cuban child Elian Gonzalez is picked up off the Florida coast after the boat in which his mother, stepfather and others had tried to escape to the US capsized. A huge campaign by Miami– based Cuban exiles begins with the aim of preventing Elian from rejoining his father in Cuba and of making him stay with relatives in Miami. Elian allowed to rejoin his father in Cuba after prolonged court battles. OCT - US House of Representatives approves the sale of food and medicines to Cuba. OCT - Cuba criticizes Russia’s decision to shut down the Lourdes centre on the island, saying President Putin took the decision as “a special gift” to US President George W Bush ahead of a meeting between the two. NOV - US exports food to Cuba for the first time in more than 40 years to help it cope with the aftermath of Hurricane Michelle. POSTER BOY FOR THE REVOLUTION DEC - Russian President Vladimir Putin visits Cuba and signs accords aimed at boosting bilateral ties. allegations about biological weapons. Carter is the first former or serving US president to visit Cuba since the 1959 revolution. JUN - National Assembly amends the constitution to make socialist system of government permanent and untouchable. Castro called for the vote following criticisms from US President G.W Bush. DISSIDENTS JAILED MAR / APR - “Black Spring’’ crackdown on dissidents draws international condemnation. Seventyfive people are jailed for terms of up to 28 years; three men who hijacked a ferry to try reach the US are executed. JUN - EU halts high-level official visits to Cuba in protest at the country’s recent human rights record. APR - UN Human Rights Commission censures Cuba over its rights record. Cuban foreign minister describes resolution - which passed by single vote as “ridiculous”. MAY - US sanctions restrict US-Cuba family visits and cash remittances from expatriates. OCT - President Castro announces ban on transactions in US dollars, and imposes 10% tax on dollar-peso conversions. JAN - Havana says it is resuming diplomatic contacts with the EU, frozen in 2003 following a crackdown on dissidents. MAY - Around 200 dissidents hold a public meeting, said by organisers to be the first such gathering since the 1959 revolution. JUL - Hurricane Dennis causes widespread destruction and leaves 16 people dead. FEB - Propaganda war in Havana as Castro unveils a monument which blocks the view of illuminated messages, some of them about human rights, displayed on the US building. 2008 Raul Castro takes over as president, days after Fidel announces his retirement. The bans on private ownership of mobile phones and computers lifted. Announcement to abandon salary equality. The move is seen as a radical departure from the orthodox Marxist economic principles observed since the 1959 revolution. Enemy No. 1â&#x20AC;? accused of downing a Cuban airliner. JUL - First time since 1959 that Revolution Day is celebrated without Castro . DEC - Castro says in a letter read on Cuban TV that he does not intend to cling to power indefinitely. restrictions on the Cuban-Americans visiting Havana and sending back money. CRISIS MEASURES APR - US President Barack Obama says he wants a new beginning with Cuba. MAY - Government unveils austerity programme to try to cut energy use and offset impact of global financial crisis. JUN - Organisation of American States (OAS) votes to lift ban on Cuban membership imposed in 1962. Cuba welcomes decision, but says it has no plans to rejoin. Assembly approves economic reforms aimed at encouraging private enterprise and reducing state bureaucracy. NOV - Cuba passes law allowing individuals to buy and sell private property for first time in 50 years. veteran politicians, including Fidel Castro ally and former parliament leader Ricardo Alarcon, are removed from the Communist Party’s Central Committee in what President Raul Castro calls a routine change of personnel. phase of a deepwater sea port is inaugurated by Brazil and Cuba at Mariel, a rare large foreign investment project on the island. MAR - Cuba agrees to a European Union invitation to begin talks to restore relations and boost economic ties, on condition of progress on human rights. T JUL - Russian President Vladimir Putin visits during a tour of Latin America, says Moscow will cancel billions of dollars of Cuban debt from Soviet times. Chinese President Xi Jinping visits, signs bilateral accords. authorities release 2,500 prisoners, including some convicted of political crimes, as part of an amnesty ahead of a papal visit. SEP / OCT - Cuba sends hundreds of frontline medical staff to West African countries hit by the Ebola epidemic. opment, US President Barack Obama and Cuba’s President Raul Castro announce moves to normalize diplomatic relations between the two countries, severed for more than 50 years. requirement for citizens to buy exit permits when seeking to travel abroad. Highly-qualified professionals such as doctors. engineers and scientists will still require permission to travel, in order to prevent a brain drain. NOV - President Raul Castro says the eastern province of Santiago was hard hit by Hurricane Sandy, with 11 people dead and more than 188,000 homes damaged. A United Nations report says Sandy destroyed almost 100,000 hectares of crops. 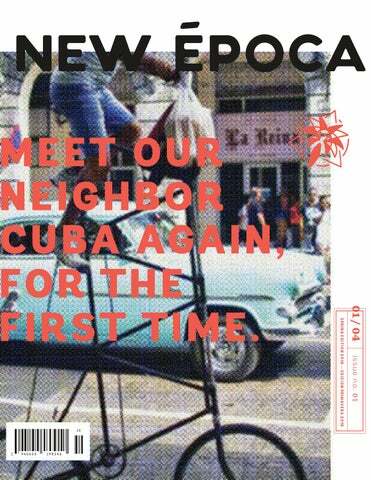 NEW ÉPOCA’S SPRING MAGAZINE FEATURES ARTICLES FOCUSING ON THE ECONOMICS OF CUBA’S AMAZING ART COMMUNITY. THE ART OF DEALING WITH CUBA . CUBA'S ABILITY TO DEVELOP A REAL ART MARKET WILL BE A SIGNAL OF HOW THE COUNTRY WILL HANDLE IMPROVED RELATIONS WITH THE U.S.
IAMI—As the United States and Cuba move toward full diplomatic relations, will Cuban art become the next thing in the art world? Or in the future will Americans get ripped off as they travel to Cuba and buy paintings, prints, and sculpture that haven’t been properly curated or priced because all art in Cuba must be sold through the government galleries? The answer to that question may seem minor compared to such issues as human rights or whether Cuba will allow U.S. companies to modernize its telecommunications system, but it would be a visible signal of the nature of future U.S.-Cuban relations. Whether Cuba develops a real art market depends on whether the Cuban government agrees to allow privately owned galleries, so that the kind of evaluation and pricing that takes place in the rest of the world also can take place in Cuba, according to Ramón Cernuda, a dealer of Cuban art in Florida. “In the United States, access to information implies a free market,” Cernuda said in a recent interview. North Korea and Cuba are the only countriesin the world that still have only government-owned art galleries, he added. Contemporary Cuban art ranges from traditional paintings of the countryside to starkly modern works that express discontent with Communist society. Foreign critics have praised artists such as Cernuda client Miguel Florido, who makes “wrinkled” paintings of the U.S. flag. But figuring out which Cuban art works are likely to have lasting value is difficult without independent critics and sales records. Cuban officials may be reluctant to change business regulations until Congress lifts the embargo, but maybe they will realize that even at $50,000, a fine Cuban painting is priced low compared with many contemporary works by artists from other countries. It would seem to be in Cuba’s interest to establish a free market that would allow its artists to earn what their works are worth and pay taxes on the proceeds. Travelers who buy art in Cuba’s government galleries “end up buying art that is not investment-grade,” Cernuda said. He encourages serious collectors to spend their time in Cuba studying art in the museums—and then make their purchases through his gallery or others in the U.S. and Europe where the art has been evaluated. IN THE EARLY 1990S, FOLLOWING THE 1989 COLLAPSE OF THE SOVIET BLOC, CUBA FACED ITS GREATEST CRISIS SINCE THE 1959 REVOLUTION. THE POPULACE WAS FORCED TO BRAVE SEVERE SHORTAGES OF BASIC FOOD AND CONSUMER GOODS AND EVEN MORE INTENSE RATIONING THAN WAS PREVIOUSLY THE NORM. to meld art, function and design. Los Carpinteros honed their craft and matured in the years following art school and before long, attracted the attention of international collectors, among them Peter and Irene Ludwig. enshrined and artists required special treatment, above all freedom of movement. As a result, Cuban artists were permitted to travel internationally for exhibitions and concerts, and were allowed to return to Cuba with the proceeds of these forays abroad with very little restriction. American ar t dealers have been exempted from travel restrictions to Cuba since the U.S. government granted a consent decree upholding the right for art exchange between the two countries under the First Amendment in 1990. The case was brought by attorney Alex Rosenberg, who together with his wife Carole in 2000 established the American Friends of the Ludwig Foundation of Cuba, , to facilitate cultural exchanges through workshops, seminars and artinspired trips to Cuba that continue. One of the world’s most renown collectors, Peter Ludwig took a liking to contemporary Cuban art in the early 1990s, and though he was unable to establish a museum in Havana as he had in several cities of Europe and Asia owing to the constraints of the Special Period, he instead set up the Ludwig Foundation of Cuba. from the exposure provided by the foundation, and held their first exhibit outside Cuba at the Ludwig Forum in Aachen, Germany. “We played a role in helping the Cuban ar tists,” a statement from Carole Rosenberg. “They created the economy themselves with the quality of their work.” REDEFINING THE ‘SOCIAL PACT’ Los Carpinteros ar tist Dagober to Rodriguez, who now splits his time between Havana and Madrid along with co-founder Marco Castillo, is unreserved in his praise for the NGO. “They deserve a lot of credit; it’s an absolute merit to have cooperated so well with the government and thrived through some of Cuba’s toughest years,”he says. Strong institutions like the American Friends of the Ludwig Foundation of Cuba are critical to a measured opening of the sector, Castillo adds, and the model should be replicated across other key sectors of the Cuban economy. worked, and they remain proponents of the Cuban ideal, albeit with a strong dose of pragmatism. entrepreneurial model, where the government aims to relieve itself of the burden of many small, inefficient enterprises by allowing them to become independent. “The reason that the state has this t wo-pronge d s trateg y is largely b e c a u s e i t w a n t s to re t a i n i t s monopoly on import, export and the professions, i.e., on the parts of the economy that matter, and ‘unload’ many ‘redundant’ state workers, leaving them, or allowing them the freedom, to work‘on their own’ in occupations that are largely unproductive and survival oriented, even medieval,”says Henken. In carving out specific segments for private actors, however, the door has opened for entrepreneurs to create new business entities. deals for food imports from Miami and to establish foreign companies in the special economic zone connected to the port of Mariel. It’s a start, he says, that will inevitably lead to a demand among international investors for assets on the ground. Jordan is among those Cuban entrepreneurs fortunate enough to have lived abroad. He spent a year in Port of Spain, Trinidad, in 2004, working with EY, before returning to Cuba to rejoin the ranks of government employed attorneys, biding his time for the right moment to invest in his own firm. Jordan isn’t alone. Many entrepreneurs with international experience are returning to Cuba to set up shop, en coura ge d by th e m os t re cent rounds of economic reforms. Luis Gell spent eight years studying photography and working in Europe. He specialized in still life and architectural photography and worked with some of Italy’s top architects. Upon returning to Cuba, he established Studio 50, a full service independent production studio cooperative offering professional photography, videography and design services. He works with Cuba’s three state-owned music labels, BIS Music, EGREM and Producciones Colibri, as well as with private clients from Cuba and abroad. opportunity and rights, but it has taken the position that egalitarianism creates lazy freeloaders, which would have negative consequences for efficiency and productivity throughout the economy, Henken adds. “The reforms are in that vein, to grant freedoms and allow a disciplined workforce to be rewarded.” As Cuba warily opens its doors to greater engagement with the U.S., any erosion of the social guarantees Cubans have long considered their birthright will face resistance from those who rely most on the state for their day-to-day sustenance. Cuban policymakers will need to summon all the inventiveness their people are known for to strike the right balance between provider and facilitator as the state cedes space for private enterprise to flourish. “NECESSITY IS THE MOTHER OF ALL INVENTION” GOES THE PROVERB, AND FEW COUNTRIES IN THE WORLD HAVE TESTED ITS SALIENCY QUITE LIKE CUBA. suffocating half-century mix of communist socio-economic policies and blanket U.S. sanctions have forged a people for whom the need to “resolver”—improvising solutions by repurposing the scarce resources around you—has become more than just a way of life. It is arguably the only way most of them are able to create value in their society. To many in Cuba, the “resolver” mindset represents the defiant and indomitable spirit of the Cuban people. To others who once took pride in what their country had accomplished before or immediately after the Revolution (depending on their politics), it is a persistent and embarrassing reminder of the failures of their system. Yet, it turns out that during this time of change for the Caribbean island, this same ethos is increasingly becoming something to celebrate, and more importantly, to study. As Cuba seeks to reintegrate itself into the global economy, its harsh conditions have inadvertently given fruit to one of the greatest assets a workforce can possess in the 21 st century: a deep-rooted culture of constraint-based innovation and collective ingenuity — one that often remains at odds with the government’s rigid central planning offices. THEY THINK AND ACT FLEXIBLY. THEY SEEK OPPORTUNITY IN ADVERSITY. Frugal innovators identify opportunities within the harsh constraints of their markets to create value. Cuban ingenuity as we know it today was born in the 1960′s, as replacement parts for American products became increasingly scant due to the U.S. trade embargo. Eventually groups like Associación Nacional de Innovadores y Racionalizadores began to form and convene professional scientists and engineers with blue-collar mechanics and technicians to develop alternative solutions to problems created by scarcity. Many of the practices honed by ANIR became public policy during the so-called “Special Period,” when the government distributed manuals that taught Cubans how to “reduce, reuse and recycle” everyday items in order to survive the crushing shortages caused by the loss of Soviet subsidies. After five decades of overcoming extreme hardship, it is safe to describe Cuba as a country of eleven million people with a hacker mindset. Today, they count not just on their creativity to get ahead, but on a growing chain of external suppliers, mostly in Miami, who provide them with the parts, tools, and PDF manuals they need to deliver simple but effective products and services. To innovate in a constraint-based environment, frugal entrepreneurs must quickly respond to changes in their environment with entirely new value propositions. Architects and engineers are prohibited from private sector practice in Cuba, but that has not stopped many of them from leading a quiet urban renewal in Havana, re-imagining, re-purposing and renovating old run-down properties into new spaces. They do so by operating under permitted licenses for construction, interior decoration, home sales and masonry, pushing the legal envelope to build many of the capitol city’s most exciting cultural and culinary destinations. THEY KEEP IT SIMPLE. The “resolver” mindset requires that entrepreneurs focus on developing “good enough” offerings that are accessible and easy to use. While Raul Castro expanded private sector enterprise in 2011, the state’s superior education system has failed to offer ongoing MBA programs or courses in business administration. Nor does it allow private schools that could offer a business curriculum to open in the island. Enter the Cuban Catholic Church, which, recognizing a need to provide practical business training to Cuba’s new entrepreneurs, began offering part-time workshops through its country-wide network of churches and cultural centers. These workshops have taught thousands of entrepreneurs the fundamentals of how to start and manage a business and are fostering a vibrant entrepreneurial ecosystem in Cuba. As Cuban entrepreneurs start to enjoy greater access to the American private sector, they will undoubtedly gain an abundance of insights that will help their businesses scale and succeed. But their own ingenuity and approach can also be leveraged in more formal environments to produce innovative solutions that do more with less. U.S. entrepreneurs looking to build and sustain growth in today’s increasingly complex and volatile business lan scape would be well served to seek inspiration in the creativity, resilience and resourcefulness of the “resolver” mindset. Frugal innovators search for ways to include marginal segments of society, not just out a sense of empathy, but because it makes business sense for them. Cuban entrepreneurs are rising up to the challenge of addressing the unmet needs of their most disadvantaged countrymen and women. Thanks to remittances, the informal economy, and a burgeoning private sector, approximately a third of Cubans have the means to purchase imported food and personal hygiene products. Everyone else, especially rural Cubans, continues to depend on government rations of goods for basic subsistence, over 70% of which is also imp orted due to poor agricultural policy. While many independent businesses make headlines for serving the needs of Cuba’s tourists and emerging middle class, the vast majority of private businesses cater to the less affluent. Agro-ecologist Fernando Funes Monzote serves both sectors. Through his Finca Marta, a lucrative 20-acre solar-powered urban farm in Caimito, Funes Monzote not only provides Havana’s top paladares with organic produce, he also seeks “to give Cuban farmers a way to make a living at a time when so many have given up on it and moved to urban areas.” Funes Monzote is working on developing a weekly produce basket to distribute to individual families, providing an effective and healthy alternative to the government’s basket. CU BA El Grupo Bayate; Luis Rodriquez Cuba, 2015. CUBAN ART, JUST LIKE CUBAN CUISINE AND DEMOGRAPHICS, OFFERS A COSMOPOLITAN COMBINATION OF THE VARIOUS CULTURES THAT HAVE BEEN BLENDED TOGETHER OVER THE PAST FIVE CENTURIES OF THE ISLANDâ&#x20AC;&#x2122;S LIFE. For most of the history of Cuba, the dominant Spanish-European styles dictated the artistic professions, with classicism reigning for painting, sculpture, and architecture. Only within the last 100 years, have the traditions been overwritten with new styles becoming more prominent. he styles incorporated by Cuban artists into their work include contemporary influences from North America and Europe, traditional tribal art from Native American and African cultures, and styles that are unique to the Caribbean. UNTITLED Gouache on heavy paper Eduardo Abela, 1951. L A S I E S TA Antonio Gattorno, 1939-1940. DURING THE COLONIAL YEARS From 1500 to 1900, the Spanish empire controlled Cuba and many of the islands within the Caribbean. Spanish politics ruled the day as only the wealthy landowners of the island had the money to commission portraits, landscapes, busts, or buildings. Classicism and neoclassicism as espoused by the Spanish schools of art influenced Cuban art. in major cities that portrayed working class persons and poor families. Paintings became tools for politicians and journalists criticizing the Machado regime. Realism and romanticism were major hallmarks, with little subjectivity on the part of the artist’s work. INDEPENDENCE & NEW CUBAN CULTURE When Cuba won its freedom from Spain in 1898, many prominent artists began to be able to challenge the status quo of the island’s cultural scene. During the first decades of self-rule, a major break from the conventional came from the Vanguardia artists, a counter-culture revolutionary cause, illustrated Cuban life through surrealism and cubism rather than the conventional workings that Cuban art schools espoused. When Cuba cast off Machado in 1959 and formed a socialist nation under control of Fidel Castro, the visual art scene lay at a crossroads. Some left the country to pursue better financial opportunities, especially since a large amount of art revenue had come from American tourists visiting Cuba. Others stayed in order to produce governmentsponsored art. Some artists embraced the socialist revolution. Alberto Korda, perhaps the best-known Cuban artist of all time, was a photographer who explicitly chronicled the socialist revolutions across Latin America; his picture of Che Guevara has become the iconic image of the Marxist revolution in South America. Since the socialist party of Cuba censored art, non-revolutionary content was discouraged; not until the 1980s would artists return to making works that had no pressure from the communist state influence. Painter Antonio Gattorno’s work The Siesta represents the strain of workers who had oppressive work conditions. TH E FI LM ROLL Guerrillero Heroico Cuba, March 1960. C H E G U E VA R A Guerrillero Heroico Cuba, March 1960. By the end of the 1960s, the image, in alliance with Guevara’s subsequent actions and execution, helped solidify the charismatic and controversial leader as a cultural icon. Korda has said that at the moment he shot the picture, he was drawn to Guevara’s facial expression, which showed “absolute implacability as well as anger and pain.” Later, Korda would say that the photo showed Che’s firm and stoic character. This trend can be attributed in part to works in the 1970s and 80s that changed the tone of the dialogue on artistic freedom; a new national art school was founded in 1976 and an annual exhibition titled Volume One allowed any artist to portray their work. The Spontaneous movement developed to contrast government sponsorship, creating mediums of expression that developed organically. Spontaneous artists struggled to finance their work, however, and remained largely unknown. MODERN CUBA AND MODERN ART Today, the restrictions on artistic license have been mostly lifted even as the government remains the number one source of funding and employment for Cuban artists. Recurring themes in contemporary Cuban works are the attempt to keep culture alive in an era of national homogeneity and globalism. The Grupo Bayate, an organization of Cuban “Naive” artists, has portrayed works of Cuban communities and traditions rarely seen by outsiders through collections in Cuba as well as North and South America. The Grupo Bayate is headed by Luis Rodriguez, whose son Luis also paints for the organization. NEW ART AND NEW ARTISTS Conceptual art as a means of expressing ideas rather than subjects became a trend in Cuban painting during the 1970s and 1980s. This type of visual style requires a much greater emotional investment in a piece by the viewer, leading them to create their own conclusions rather than have the artist directly speak to the subject matter. New Artists in Cuban exhibitions like “Volume Uno” include Tomas Sanchez, whose urban graffiti paintings illustrate the subjectivity of expression. Ana Mendieta, who has created a long legacy since her early death, created the Silueta Series of land and body sculptures that combined the physical with the human for what she called an “earth-body” experience. She would use her own body as well as that of models silhouetted in dirt, grass, fire, and rock in order to blur the lines between the world and the life upon it. Lucy Lippard, who has written nearly two dozen books on contemporary art, blended together aesthetics with politics in her Lure of the Local series to better integrate the emotional and the intellectual. Father and son illustrate everyday life in Cuba from sources that have little means of exposure; paintings of sugarcane workers and Catholic religious rituals are contrasted by the few native tribes of Cuba that retain ethnic identities and practices. UNTITLED Silueta Series, Mexico, 1976. Ana Mendieta formed a silhouette on the beach at La Ventosa, Mexico, filling it with red tempera that was washed away by the ocean waves. She then documented the obliteration of the figure by the tide in a sequence of 35 mm slides. UNTITLED (TREE OF LIFE) Silueta Series, Often Ana Mendietaâ&#x20AC;&#x2122;s works honor the divine feminine through the goddess image and the natural world. She performed while Hans Breder photograped The Goddess Silhouettes, which were earthworks, sculptures and performances symbolize the creative, fertility of the divine feminine and the power and beauty inherent in the earth. A performance by Ana Mendieta, she is filmed and photographed by Hans Breder. Mendieta kills a chicken and covers herself in its blood and then in its feathers. She is transformed into a bird, which she felt was reflective of a cross cultural symbol of transformation and the shamanic flight into the spirit world. NEW ÉPOCA’S SPRING QUARTERLY MAGAZINE INFORMS YOU ON THEIMPORTANT CURRENT EVENTS YOU SHOULD KNOW ABOUT. C U B A’ S A R T S C E N E AWA I T S A T R AV E L B O O M .
TA N I A B R U G U E R A : I N H AVA N A , A JOURNE Y THE FORBIDDEN WITH A P R O V O C AT I V E A R T I S T.
CU BA R EFUSES TO R E T U R N SEIZED A R T D E S P I T E T H AW I N R E L AT I O N S WITH U.S.
NEW ÉPOCA’S SPRING QUARTERLY MAGAZINE INFORMS YOU ON THE IMPORTANT CURRENT EVENTS YOU SHOULD KNOW ABOUT. AVANA—Kadir López was working in his studio at his elegant home here when the doorbell rang. It was Will Smith and his wife, Jada Pinkett Smith. the Internet and, at the same time, celebrated by a coterie of international buyers whose curiosity and determination brought them to Cuba long before talk of a thaw. “I had no idea they were coming,” said Mr. López, whose work incorporates salvaged American signs and ads that were torn down after Fidel Castro’s 1959 revolution. Santiago Rodríguez Olazábal's “Cosa sencilla,” at Galería Habana. About an hour and $45,000 later, Mr. Smith had bought “Coca Cola-Galiano,” an 8-by-4-foot CocaCola sign on which Mr. López had superimposed a 1950s photograph of what was once one of the most bustling commercial streets in Havana. Cuban artists—from the most established to those still studying at the Higher Institute of Art—receive visits from institutions like the Bronx Museum of the Arts and the Museum of Modern Art and from visitors. Many of the visitors are wealthy intellectuals who travel to Cuba on “people-to-people” trips that are perrmitted under the embargo. announced that the two countries would move to restore diplomatic ties. He is now booked through March with Cuba visits. “It’s absolutely crazy,” he said. Even though Americans can visit Cuba under rules dating to 2009 that allow “purposeful travel” intended to foment contact with Cubans, many shied away, Mr. Magnan said. “It’s a hassle,” he said, about the need to get a license from the American government and pay for works without using an American credit card. Now, h owever, “ th ey’re saying, ‘I want to go before everyone else does,’” Steve Wilson, a Louisville, Ky.-based collector with M r. M a g na n in Hava na , snapped up eight pieces, mainly by young ar tists, with price tags between $1,500 and $15,000 on Sunday night at the Fábrica de Ar te Cubano, an ar t space in a factory. “If 500 collectors turn up all of a sudden, quality will go down,” said Roberto Diago, 43, whose artworks explore the issue of slavery and race in Cuba and sell for between $2,000 and $30,000. Mr. Diago said he had “lost count” of the number of studio visits to his 1920s mansion in a sleepy Havana suburb. Still, a lot of artists are barely known, especially outside Havana, said Sandra Levinson, a founder of the Center for Cuban Studies in New York. Other than Magnan Metz, she said, only a handful of galleries in Miami and one or two on the West Coast are focused on Cuban art. Mr. Wilson, a founder of 21c Museum Hotels, which house contemporary artworks, said he hoped the diplomatic opening would allow him to organize residencies for Cuban artists in the United States and vice versa — maybe even open a 21c in Havana. “I love the fact that more people will be able to come and see this work,” he said. Since the 1990s, the Cuban government has given extra freedom to artists, who are viewed as a pillar of the country’s cultural prestige, allowing them to travel and keep a large share of their income. Some worry that artists will begin to produce like mad in anticipation of a boom. Mr. Blue, whose Cuban works include a vinyl record made of tightly coiled eight-track cassette tape by Glenda León, an artist based in Havana and Madrid, and two sculptures by Alexandre Arrechea, including “Sherry Netherland,” a, scarlet steel sculpture of the opulent Fifth Avenue apartment hotel, said that part of the charm was getting to know Cuban artists and navigating hurdles. “If you walk into a gallery in Mexico City and say, ‘I want that in my apartment on Monday,’ it’ll be there,” he said. “It doesn’t work like that in Cuba.” He added, “The challenge makes it that much more interesting.” But for Luis Miret, director of Galería Habana, the most prestigious of about a dozen state-owned galleries in Havana, those hurdles are a drag. Currently, anything shipped from Havana to the United States—only 90 miles away—has to go through a third country, such as Panama or Britain. Miret calculates that air cargo fees from Havana to Miami would be about 70 cents a kilo; he pays about $6.70 a kilo to send things via London. “How can it be that I am allowed to publish an ad in Art Forum, but I can’t pay to participate in an art fair?” he said in his small office at the gallery. “I don’t get it.” And while Cuban artists enjoy special attention from foreign art lovers, few islanders have the income to buy art, said Adrián Fernández, who set up a studio with fellow artists Frank Mujica, 29, and Alex Hernandez Dueñas, 32, last year. 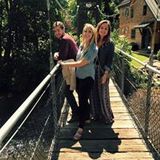 All three received a free nine-year art education, he said, but, now that they are working, there is very little in the way of grants from the government or from foundations. Mr. Miret recently lost a three-year battle to recoup $17,000 that Galería Habana wired to an account in Miami to pay for a booth at a Colombian art fair. Unfortunately the funds were confiscated by the Treasury Department. FOR MOST PEOPLE, THIS WOULD HAVE BEEN AN ORDINARY CALL — SHE WAS JUST CHECKING IN ON HIM. BUT MAXWELL'S DAUGHTER WAS IN MIAMI AND HE WAS IN CUBA — AN ISLAND WITH NO ACCESS TO U.S. CELL SERVICE JUST A YEAR AGO. axwell realized right away that the call epitomized how much Cuba has changed in just this past year, in 2015. "I was in Havana and my phone worked. It was beautiful," says Maxwell, a Cuban-American lawyer at Akerman, a law firm in Miami. Maxwell's moment represents just one of many big changes in Cuba in 2015 â&#x20AC;&#x201D; a year some call a "renaissance" for the island. One year ago today, President Obama announced that the U.S. and Cuba would begin to normalize. The historic moment was followed by a rapid change in diplomatic relations, highlighted by an April meeting between Obama and Cuban President Raul Castro. Both countries reopened embassies this year and Pope Francis blessed the new ties with a trip to both countries in September. After more than fifty years of silence, that is progress between two' governments. Th e Cuban an d Unite d St ate d governm ent s announced an agreement to resume commercial flights between the two. Margarita Perez de la Hoz has already noticed a surge in American business and tourists in Cuba. The Havana-based doctor now uses Airbnb and Trip Advisor to rent two rooms in her house to visitors. Perez de la Hoz isn't worried about American businesses, she sees it as an opportunity and a way to create jobs. "The country needs it,"
However, the surge of business interest in Cuba has been tempered with the reality of hurdles ahead. The United States embargo is still in place and the Cuban government is taking its time getting to know United States firms. Another hurdle is that some of the investments Cuba wants, such as oil drilling, are barred under the embargo. And some of the businesses most eager to get to Havana, such as hotel chains, are not at the top of the government's priorities, says Alana Tummino, a policy director at the Council of the Americas who has led U.S. companies on trips to Cuba. After decades of not talking and drastically different approaches to business, Corporate America and the Cuban government are still just trying to build trust, says Tummino. "There's no lack of excitement" from U.S. firms, says Tummino. But compared to hopes,"they realize that this is going to be a longer process." The Obama administration has chipped away at the embargo by amending some business restrictions. In September, new regulations paved the way for a U.S. business to establish a brick-and-mortar store on the island. But ultimately, Congress will have to lift the embargo to truly pave the way. Experts say telecommunication firms are likely to be among the first industries to arrive, possibly as soon as the first half of next year. Cuba badly wants infrastructure for internet and connectivity. Although the business pace may be slower than some would like, virtually everyone agrees it's been a landmark year for Cuba. "This is the beginning of of a new renaissance," says Cuban-American lawyer Pedro Freyre, who represents many United States companies who want to go to Cuba. "We have all seen things we never thought we would see a year ago." American businesses, after five decades of being barred from Cuba, were eager to make just as much progress. At first, change came quickly. Airbnb and Netflix started operating in Cuba earlier this year. Many travel companies, including Jetblue and Norwegian Cruise Line have made plans to increase service to the island. This pass fall, the pace of change picked up even more. Verizon and Sprint finally reached deals with the Cuban government to offer roaming service in Cuba â&#x20AC;&#x201D; that's why Maxwell's phone worked in Cuba when his daughter called. IN HAVANA, A JOURNEY INTO THE FORBIDDEN WITH A PROVOCATIVE ARTIST. t was still dark when Tania Bruguera hopped into a cab with us on her way to Revolution Square. “All of a sudden it looks quite subversive what we’re doing,” she said. Her voice revealed a little nervousness, but it translated into a giddy laughter. The last time Tania Bruguera planned a trip like this, Cuban security agents hauled her out of her mother’s apartment and put her in jail. But just two months later, here she was in a cab with some NPR journalists, navigating the streets of Havana. Bruguera is a provocative Cuban performance artist. In December, right after President Obama and Cuban President Raúl Castro announced their diplomatic breakthrough, she flew down to Havana, Cuba from New York City, New York where she has lived in recent years. “I don’t know what would happen, I think I would not be allowed to arrive there.” After some futile talks to get permission from Cuban officialdom, she announced that she would stage a performance piece at the square, a sacred place for the regime. She invited Cubans to come speak freely into a microphone for one minute about life on the island. It was the first real test of just how tolerant the country had become of dissident voices. Some dissidents showed up and security forces arrested more than thirty of them. The event never happened. Bruguera was detained before she could even get to the square, and her Cuban passport was taken. In the months since, she has been jailed twice and interrogated several times. Now, looking out the window, we could see lights in the tall buildings of Havana starting to come on. We could see the sidewalks and the pavement bathed in the yellow hue of the street lights. and interior with outline portraits of Ernesto “Che” Guevara and Camilo Cienfuegos, two of the country’s bearded revolutionary heroes. La Plaza de la Revolucion, Havana’s version of Moscow’s Red Square or Beijing’s Tiananmen Square, as the sun rises over the city. Bruguera said that since her aborted performance, the Cuban government has tried to intimidate her. The prosecutor handling her case checks in with her a few times a week, she said, and the block leader makes sure she knows that they are watching her at all moments. For the first few weeks following her performance, state security vehicles parked outside her place in Havana. And she said that in an effort to alienate her, the state has tried to scare her friends. “Good politicians know how to give new meanings to everything,” she said. “And the Cuban revolution has been a very good example, almost a case study of that. Fidel was really brilliant at changing the meanings of things, and that’s what an artist does — an artist rethinks the meaning of things.” In choosing this hallowed, political ground for her performance, Bruguera said that she wanted to “give art a space in the history of the country.” All of that, obviously, didn’t happen. Instead, Tania Bruguera’s future is now a huge question mark. The government has yet to decide whether she will charged and tried for what they hold was an attempt at inciting a public disturbance. Tania Bruguera’s passport is still in their hands. The day before, Bruguera told us that she feels like she is re-enacting her Russian roulette piece — this time taking her chances with Cuban authorities. By the time we wrapped up our interview, we were no longer under the cover of night. Bruguera was standing at Revolution Square in broad daylight. A lone police officer was now keeping watch, and as we made our way back to the tax cab, Tania Bruguera greeted him. “Buenos dias,” she said. He just nodded. As we talked, the sky began to turn orange and the stars began to fade into the light. In a space like this and talking to a person like Bruguera, the line between art and politics seemed blurred. WITH THE LOOSENING OF UNITED STATES RESTRAINTS ON TRADE WITH CUBA, PRISONER EXCHANGES AND THE PROMISE OF WARMER TIES TO COME, THE TWO COUNTRIES ARE CLOSER THAN THEY HAVE BEEN FOR 50 YEARS. BUT FOR THOSE CUBAN EXILES IN THE US WHOSE ART WAS SEIZED BY THE CUBAN AUTHORITIES IN THE 1960S, RESTITUTION OF THEIR PROPERTY IS STILL NO CLOSER. CUBA CONTINUES TO DISMISS THE CHARGES THAT THE ART WAS STOLEN, LEAVING NO MEANS FOR ITS RETURN. he latest c ase involves a Cuban-born neurosurgeon who lives in Jacksonville, Florida. Javier Garcia-Bengochea is claiming Francesco Guardi’s View of the Lagoon between the Fondamenta Nuove and Murano, 1757, from the National Museum of Fine Arts in Havana. GarciaBengochea says that one of his relatives bought the painting at Parke-Bernet in New York for $1,000 in 1957 and then took it to Cuba. Garcia-Bengochea’s family supported Fidel Castro in the early 1950s, hoping that the rebels might staunch the era’s flagrant corruption, but that support soured once the insurgency prevailed and nationalisations followed. Garcia-Bengochea’s parents and other relatives decamped to Florida. The picture was seized from a relative’s house in Cuba and ended up in the Havana museum, where Garcia-Bengochea saw it a few years ago. He tried in vain to show documents detailing the 1957 purchase to staff at the museum. “In most of the articles you read about missing art in Cuba, the question is—where is the piece? That’s not my issue. I know where it is, I just can’t get to it. There’s no method of my claimed ownership being adjudicated,” Garcia-Bengochea says. “At least it’s in a museum, and not in some official’s house,” says Alberto Bustamante, a doctor and book collector in Orlando, Florida, who traced the seizure and sale of art from private Cuban collections in his book The Pillage of Cuban Patrimony, 2012. Bustamante and others predict that rising international demand for Cuban art could induce cash-poor officials to sell confiscated art to visitors with dollars. The sale of nationalised art abroad began almost immediately after the first seizures. After 1959, Cuban rebels stripped official buildings of art, books and architectural decorations, and the homes of those who fled the country were also emptied. Much of the seized material was immediately sold abroad; other items were placed in museums. Some are still piled up in warehouses in Havana. “In most of the articles you read about missing art in Cuba, the question is — where is the piece? That’s not my issue. I know where it is, I just can’t get to it. There’s no method of my claimed ownership being adjudicated,” Sources say that from the 1960s to the 1980s, staff in Havana museums often sold objects under the counter to diplomats and wealthy visitors. Some badly paid curators survived on that trade. BOOMING MARKET The market for Cuban art is booming; 20 th Century Modernists such as Wifredo Lam, Amelia Peláez and René Portocarrero are particularly popular. Works by these artists once filled homes in Cuba that were pillaged in the 1960s. The Miami-based dealer Ramon Cernuda believes that a boom in US tourism to Cuba could also be a windfall for 20 th Century Cuban Modernism. “US collectors who go to Cuba are finding out that you can buy these artists for very little money, compared with the prices for other top 20 th Century artists,” he says. Pressure in the US from the influential Fanjul sugar dynasty and others led to stiff penalties on anyone selling art that had been confiscated in Cuba. Under the Helms-Burton Act of 1996, the families of traffickers in stolen Cuban art could be denied entry to the US. In response, both Sotheby’s and Christie’s consignments of objects if the names of pre-Revolution owners or known dealers in seized Cuban art came up. The stringent law has driven much of that trade underground. DISAPPOINTMENT IN BOSTON Another outstanding issue between Cuba and the US involves the claims made by US citizens for industrial, commercial and private property seized in Cuba after Castro came to power. According to some estimates, this property could be worth around seven billion dollars. These claims now serve to block museum loans between the US and Cuba. The exhibition “Wifredo Lam: Imagining New Worlds” at the High Museum, Atlanta, will show paintings and works on paper by the late AfroChinese-Cuban artist. The director and curator of the McMullen Museum at Boston College, the show’s initial venue, travelled to Havana to secure loans of works by Lam from the Museum of Fine Arts. The Havana museum agreed to send a group of pictures, but the loans were never made. The US State Department discouraged the Boston museum from applying for immunity from seizure for the pictures, citing Cuba’s status as a country that “supports international terrorism”. Even with immunity from seizure from the State Department, that stigma put the pictures at risk of being held to satisfy outstanding legal claims against US property seized by the Cuba govermnet. The US’s loss is Europe’s gain. Works by Lam from Havana are now due to travel to a retrospective at the Centre Pompidou, Paris, in September. customers, but now, “70% of our sales are to nonCuban Americans”, he says. As the market rises, pieces that once disappeared could resurface, and specialists warn that the issue of restitution must be faced head-on. “People aren’t going to feel comfortable buying [art] if they think that somebody’s going to come down the line and take it away from them,” says Mari-Claudia Jiménez, a Cuban-American lawyer specialising in art recovery at the firm Herrick Feinstein in New York. One of the problems faced by those seeking the return of their property is that there are few records documenting the nationalisations and the subsequent sales of works abroad. Nevertheless, “there are people who are still alive who remember the paintings on the walls of their houses, and who have pictures of them”, Jiménez. NEW ÉPOCA’S SPRING MAGAZINE SHOWCASES AMAZING CUBAN ARTISTS THAT HAVE MADE A MARK ON CUBAN ART. THE HIPPEST PLACE TO BE IN HAVANA IS AN OLD OLIVE OIL FACTORY ONCE KNOWN AS EL COCINERO. REINCARNATED THIS FEBRUARY AS THE Fﾃ。RICA DE ARTE CUBANO (FAC), IT IS THE BRAINCHILD OF CUBAN ROCKER, RAPPER AND FILMMAKER EQUIS ALFONSO X AND IS ALREADY TAKING THE CUBAN ARTS SCENE BY STORM . with a mission to tear down the walls between different artistic mediums, shed art world pretension and bring together the entire community. It was inaugurated with a bang: X himself performed among the works of 33 other Cuban artists. No one on the island is better suited to promote the FAC’s unique blend of mixed media than X . Now 41, he was raised in a world of ar tistic fusion, studying classical piano from the age of seven, playing in the jazz group Estado de Ánimo, and—upon completing his conservatory training—joining his parents Carlos Alfonso and Ele Valdés in their Afro-Cuban symphonic rock group, Síntesis, where he contributed percussion and vocals. READ ON FOR A PEEK INTO THE LIFE OF THIS TALENTED LADY! LOURDES SANCHEZ IS A CUBAN-BORN ARTIST AND TEXTILE DESIGNER RESIDING IN BROOKLYN, WHERE SHE MAKES HER PAINTERLY WATERCOLOR PATTERNS THAT ARE EQUAL PARTS GEOMETRIC AND ORGANIC. HER CLIENT LIST IS A ROSTER OF AWESOMENESS: ANTHROPOLOGIE, KATE SPADE, CRATE & BARREL AND PRABAL GURUNG, TO NAME A FEW. SHE WAS EVEN SNATCHED UP BY WEST ELM, WHO TRANSLATED HER ART INTO FRAMED PIECES AND PILLOW DESIGNS FEATURING AQUATIC MOTIFS. Design*Sponge: What is in your toolbox? Lourdes Sanchez: Incredible white mask liquid frisket, Arches watercolor paper, lots of wall space for mood boards, T pins, masking tape, hardware store sponge brushes, .07 mechanical pencils with 2B leads, kneaded erasers, my library, Pinterest. DS : What is on the top shelves of your inspiration library right now? Lourdes Sanchez: I am looking at the books Signs and Symbols: African Images in African American Quilts by Maude Southwell Wahlman; The Sun in Art, first published in 1962 and edited by Walter Herdeg; and Ellsworth Kelly’s Tablet. I also have a stack of vintage Vanidades magazines from the early ’60s through the ’70s that I bought in Mexico and beautifully faded old cotton Indian block-printed bedspreads and skirts from flea markets that have been piling up. or filed away, and so on. It clears my mind for new things and gets things organized for when I start designing and painting again. I do a to-do list with a big Sharpie and put it on the refrigerator door. Agenda books tend to get lost under piles of ephemera when the studio gets busy. DS : If you could have one superhero (or magical) power, what would it be and why? LS: I would love to be able to disappear and then pop up anywhere else in the world whenever I wanted. DS : What is the best advice you have ever received, and what is the one piece of advice you would offer to a young artist/designer? LS: To be honest, most of the advice I have received was mostly useful by doing the exact opposite of that advice. Even the most sincerely offered advice is only someone reporting back from their own life story. So I don’t really like to give advice. I would just say that I believe in studying and looking at everything, combined with going deep inside yourself and bringing out what is truly and uniquely in you, combined with a steady and regular practice so that you have the skills to realize your vision. DS : How do you combat creative blocks? LS: I don’t have creative blocks. I tend to have too many ideas at once, and that can be over whelming, paralyzing and anxiety-producing because I don’t know which ones to do first in the time I have available. I make a rough list of ideas in the order I can do them, and that helps a lot. DS : Where do you like to shop for inspiration? L S: I don’t go out looking for inspiration as much as it happens naturally when I am doing things I love to/need to do anyway. I love going to the Rockefeller wing of the Metropolit an Museum, second-hand bookstores in any city or town I find myself in, nature books in the basement at Strand, vintage clothing stores, Brooklyn Flea, children’s drawings, high-end florist shops, found objects, the Balenciaga store in Chelsea New York City, trees and vegetation anywhere, long walks around Gowanus with my little camera, the old markets in Yucatan, Mexico. “Inspiration” is a nonstop stream, really, that can be anywhere at any time. DS : If you could peek inside the studio/toolbox of any designer/artist/craftsperson, whose would it be and why? LS: I would love to have seen that of Morris Louis, as it’s still such a fabulous mystery how he did it. DS : If you could make a master mix-tape of music that is inspiring you at the moment, what would it include? LS: Some songs in rotation at the moment are Er ykah Badu, “Window Seat”; Blood Orange, “Sutphin Boulevard”; Air, “Ce Matin La”; Joy Division, “Atmosphere”; N e w O r d e r, “ T h i e v e s L i k e Us”; R y C ooder, Paris, Texas soundtrack, “She’s Leaving the Bank” and “Cancion Mixteca”; Silvio Rodriguez, “La Gota de Rocio”; Carter Burwell, True Grit soundtrack, “The Wicked Flee.” In between, I am also listening to Jeanette Winterson reading her book Why Be Happy When You Can Be Normal? as an audiobook. GET COOL CUBAN PRODUCTS FROM REAL CUBAN ARTISTS, NOT THE TOURIST JUNK YOUR ABUELOS BUYS YOU. VISIT NEWEPOCA.COM TO PURCHASE PRODUCTS AND FIND OUT MORE ABOUT THE ARTISTS FEATURED IN THIS QUARTER'S MAGAZINE. EXILED CUBAN AUTHOR, ABILIO ESTEVEZ. OCCASION THE AUTHOR BRINGS US THE STORY OF VICTORIO, A CHARACTER WHO SHARES HIS PAINS AND PASSIONS. ust a few hours after the launch of the book in the Alejo Carpentier room, the novelist with a degree in Hispanic Language and Literature responded by email to some questions for the readers of 14ymedio, from Barcelona’s Gothic Quarter where he lives and creates. “I’m not one who is going to close doors on himself.” 14ymedio: To those who still haven’t read Los palacios... and hope to get a copy at the Book Fair, what would you like to warn them about before they enter your pages? Estevez: Nothing, I would not warn them. I think should have its own importance, and the author should pass as unnoticed as possible. Also, the book should always be a mystery to solve, an adventure about which you have no idea. When I was in high school, for example, there were many books I didn’t read because of “warnings” from my teachers. Or I prejudged them, if I read on the back of Buddenbrooks that it was “a reflection of bourgeois decadence.” Later I read those books, I enjoyed them, and I realized the time I had lost because of the “warnings,” which most of the time were too biased. “I’m not one who is going to close doors on himself.” 14YM: The novel was originally published by Tusquets Editores, in 2002. What was the process to achieve this Cuban edition? as is natural, imagination. There is a moment in the novel, for example, when Victorio says he never knew love. A true friend, a night of confidences, said to me, “It has happened with me as with you.” “What happened to me?” I asked. Never having known love. I had to laugh. However confessional a novel may seem, it is no more than that, a novel. 14YM: How do you deal with distance when writing about a reality that you haven’t lived since two decades ago? from where?” I didn’t understand until much later, although my interpretation had nothing to do with religion, because I wasn’t religious. I remember a phrase of Elias Canetti: “Only in exile does one realize how much of the world has always been a world of outlaws.” It’s very good for a writer, this sensation of losing things, of knowing that you are not going to have them again. 14YM: Readers have followed and admired your work for years. Will we soon be able to enjoy a presentation of your novels where you will be physically present? Will you return to this Havana of “the distant palaces”? Estevez: Thank you for the “followed and admired.” This question has no answer. It does not matter to return or not return, because I really want to return to is the times that I lived and that, to my knowledge, is not possible. different in each place where one lives. The same distance as literary material. I don’t live this reality, but I live another that also wants to be narrated. Also, I always remember and quote that phrase of Nabokov’s in a wonderful interview, when he responded that everything he needed of Russia he carried with him. A recent inter view with Los Carpinteros in their Havana studio shed some light on the process by which three individual ar tists work as one author. AT THE ROOT OF LOS CARPINTEROS IS AN UNBASHED RESPECT OF CRAFT, IN WHATEVER FORM IT MAY TAKE. THE NAME OF THE CUBAN ART COLLECTIVE, MADE UP OF MARCO CASTILLO AND DAGOBERTO RODRÍGUEZ (& UNTIL 2003, ALEXANDRE ARRECHEA), ABANDONS THE NOTION OF INDIVIDUAL AUTHORSHIP AND INSTEAD ADOPTS THE STORIED LEGACY OF THE ARTISAN AND THE SKILLED LABORER. BEST KNOWN FOR TONGUEIN-CHEEK DRAWINGS AND SCULPTURES THAT BONDS VARIOUS MEDIA WITH POLITICAL CONTENT DERIVED FROM EVERYDAY LIFE (PAST WORKS INCLUDE A STOVE MODELED INTO THE SHAPE OF A SOFA, A CONGA DRUM MELTED INTO A DRIPPING POOL OF INK-LIKE METAL, AND AN AIRPLANE RIDDLED WITH WOODEN ARROWS), THEIR WORK CONTESTS AND PERVERTS PRECONCEIVED IDEAS OF FUNCTIONALITY. T HEIR LATEST EXHIBITION, “Irreversible,” at New York’s Sean Kelly Gallery, presents a series of new work from Los Carpinteros, that rooted in the semiotics of public art, and scrutinizes how political and societal changes, community, and the role of the anonymous citizen intersect. Among the works on display is a series of sculptures inspired by select monuments in the former Soviet Union and built using LEGO bricks. Two aluminum portraits, Cachita and Emelino, mimic the iconography of the stylized, backlit representations of Cuban revolutionaries Che Guevara and Camilo Cienfuegos and apply them to the artists’ relatives. Other notable pieces include Conga Irreversible, a video installation produced for the 2012 Havana Biennial in which a company of dancers perform the traditional comparsa dance backwards, and Tomates, an installation of multiple sculptural elements representing the act of political protest the world over. or the history of design? DAGOBERTO RODRÍGUEZ: We see as a whole body. But sometimes we don’t know very clearly what’s a piece of art and a piece of very good design, maybe because we d o n’ t m a ke d is ti n c ti o n s— because a very good design is a piece of art. So we are confusing these things, no? But at the beginning, when we started our career, we were totally impressed by catalogs. Ikea catalogs, the Sears 19th-century catalog. Amazing. Amazing objects. MARCO CASTILLO: I think art history and design are really not correct to think or to help to think about our inspiration. Probably, this work is useful to talk about the appearance of our work. But really, the inspiration comes more from life and social things, and sometimes politics. And we later find a body to put these ideas and these feelings into. For example, we are interested in everyday objects, but not because they are beautiful or they are design, or anything like that, it’s because they talk a lot about what we did, about how we live, about how we think. Los Carpinteros’ bold juxtaposition of era, subject, and style in “Irreversible” deftly appraises the multifaceted relationship between the public and the institution, and how political change affects the individual. Interview stopped by Sean Kelly to see Los Carpinteros in action as they installed their piece, Tomates. We managed to avoid the splatters of the watercolor-injected fruit and, after the pair washed up, we sat down to discuss art versus design, Ikea catalogs, and the power of propaganda. KELSEY: A lot the pieces that you have made before—I’m thinking of the stove furniture sculptures, for example—have a function. They can turn on and be used and whatnot, but they also have the semblance of an everyday object. Some of the pieces in the show —LEGO sculptures, specifically —use an everyday object, but the sculpture doesn’t have a function besides communicating concept. Do you think that the transition from objects that are functional to objects that are not functional is something new for you, or a new direction you’re going in? case of the monuments, our sculptures based on monuments from the past, from the beginning of the century until near half-century, even the ‘60s, these objects were used as symbols. RODRÍGUEZ: They were propaganda. Political propaganda. They were objects related with socialism; they were advertising ways of life, ways of living, and ideas about future, about— CASTILLO: Power, also. But it’s not printed propaganda. It’s almost life propaganda. They were used to get people together, as meeting points. It was a way to handle the masses. KELSEY: You use such a variety of materials, whether it’s video, or manipulation of the LEGOs, or tomatoes. When you are working on an artwork or a concept, do you look to materials as a place to explore, or does the concept dictate what you use? RODRÍGUEZ: I think the concept dictates a lot what material you have to choose. In the case of the tomato, we wanted to make the tomato like the LEGO—domestic. This was one of the things that interested us. Also, to use porcelain for the tomato to make a scenario, a domestic scenario, like a kitchen. All of those materials have a strong connection with the place where you live, no? They are very domestic, no? as a representation of people from different parts of the world and how they feel about being affected by political and societal changes? RODRÍGUEZ: It’s not only based on the things that we saw in Cuba, it’s more related to how these things make you feel. How this object makes you feel, think. CASTILLO: But the whole exhibition has a strong base in public art. Not only public art, [but the] treatment of the public, in different ways. The monuments, we know, were these amazing places that were there to keep the population amazed by the power of this certain government, all the different governments, because they don’t come from one country, they come from different countries. Then we had the Che Guevara language. It’s not only the Che Guevara, also Evita Perón being represented in Argentina. . .
RODRÍGUEZ: ‘50s propaganda. CASTILLO: Even before... are you talking about the Cuban one? RODRÍGUEZ: Yeah, the Cuban. CA S T I L LO : Th e Rus sian was something that came from the vanguardia, the avant-garde art. KELSEY: The Constructivists. CASTILLO: Constructivism. And every country developed differently. For [Cuba], the language we had was the American advertisement language. And we built our ideas and the socialism with these tools. And, I think, this technology was probably for advertisements of things in the past. The backlit drawing, you don’t see that much anymore. But what remains in the Plaza de la Revolución [in Havana] is Che Guevara [chuckles] and not Coca-Cola. RODRÍGUEZ: Using this same language. [With] the tomatoes, it’s not the public receiving information, or being punished, or anything like that. In this case it’s the public reacting. This is not related to Cuba at all, or, yes, why not? Cuba did it at the beginning of the revolution. People throwing tomatoes to a wall could be interpreted to anything— other people, to a car, against a poster, against something. It’s people reacting. THIS QUARTER OF NEW ÉPOCA’S MAGAZINE SHOWCASES SOME AMAZING CUBAN ARTISTS AND ARTICLES WITH THE HELP OF SEVERAL COLLABORATORS. WA N T T O C O L L A B O R AT E W I T H N E W ÉP OC A? INTERESTED IN BEING FEATURED IN THE QUARTER OR IN WORKING WITH US ON A NEW PROJECT? -Submission of interest in collaborating or being featured in the first step rolling. All proposals will be reviewed by the editors at New Ă&#x2030;poca. -The concept of the proposal and the value of the artist/-s and the curator in the context of Icelandic and international art scene. -Thorough description of the proposal. -Budget and production plan based on actual price estimates. -Thirty artists will be shortlisted for the second step for further development. There are four deadlines spanned across the year March 1st (Spring), May 1st (Summer), August 1st (Fall), and November 1st (Winter). Artists, curators as well as a team of curator and artist/-s can apply. One of the applicants must live and work in Cuba or be of Cuban decent. -The artist/-s must have significant body of work that New Ă&#x2030;poca can examine and develop. WHAT IS THE PROCEDURE OF STAGE 2? All the names of the thirty short-listed proposals will be made public about a month after the deadline. The month following the short-listed applicants will be invited to our office to present their proposals to the editors. Each artist/team get one hour to present their final concept. -Proposal of a program in connection with the exhibition (guided tours, symposium and events) can be included together at this stage. Applicants must hand in all documents listed above to the editors after the presentation. HOW TO SEND IN PROPOSALS? Proposals must be sent to the Andrea Novo, Editor in Chief, through e-mail to: workwithus@newepoca.com or on our website newepoca.com. -Statement on why the collaboration should occur and its artists should be showcased on our website and magazine.